Revenge of the Armorvor! New flavors of Glyarmor/Vartyrex figures are joined by Crayboth, Armodoc, Armorvor, and a few other goodies. Click here to see the March 31 2016 Onell Design drop menu. Click here to order what's still available - at press time, a few items have already sold out so you might want to get a gander fast. A new drop! 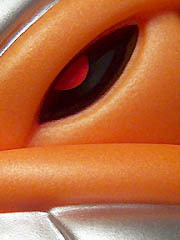 Thursday March 31, at 9:30 PM Eastern, you can order this orange Armodoc and some other surprises. No details are available, but hey - new drop! Orange! You kids like orange, don't you? Click here for a couple of more details at Onell Design.